The North American Phonograph Company! PLAYING, RECORDING, AND SHAVING CYLINDERS. Contact The North American Phonograph Company. This is Edison's Original Phonograph. It is located at Edison National Historic Site in West Orange. From the start of time man had thought about and tried mechanical methods of reproducing sounds. Starting in Ancient Egypt we have a statue of Memnon at Thebes singing the morning song to the sun. Next we have FR. Bacon who made a talking head, that had a fan rolling the letter R and movable mouth parts run by a keyboard, a tube for the nose when speaking french. 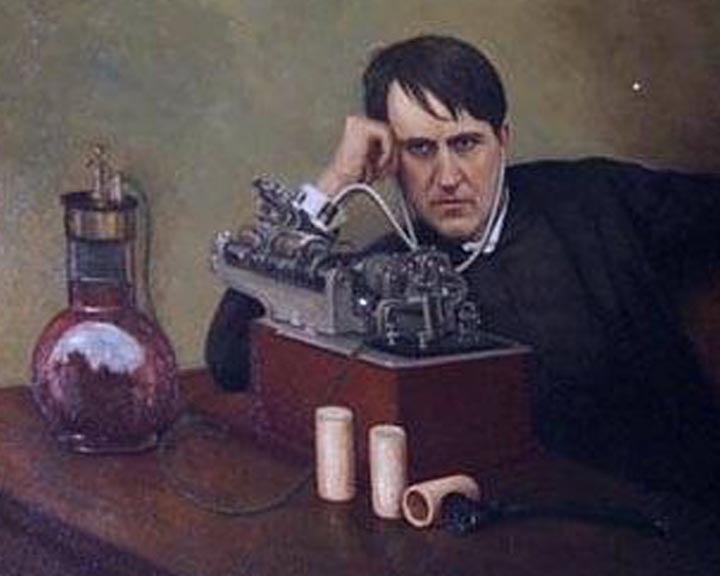 In 1877 Thomas Alva Edison was working with a telegraph repeater, and the governor on the spring motor was set to high, and the sound from the device, to Edison's imagination sounded like the human voice. 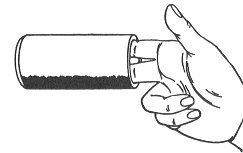 Edison was also working on improving the telephone transmitter, and knew the power of a diaphragm, and even made a toy called a phono motor which made a man saw wood, when one talked into the funnel. Edison wrote in his note book, after thinking about what he had learned from these instances drawings of possible ways of recording sound, which included a Cylinder,Disc, and Tape, and he decided to use the cylinder format. Edison gave the drawing to John Krusie his machinist, and when it was finished on December 6th, or 7th (I have read and heard both dates) 1877 Mr. Krusie took it up to Mr. Edison. All asked what is was to do, and he told them; "This machine must talk!" The Men in the laboratory at Menlo Park, thought that a talking machine was an absurd idea, and placed bets that it would not work. (A photo of the first phonograph is above). Edison placed a sheet of tinfoil on the machine, and recited: " Mary had a little lamb it's fleece was white as snow and everywhere that Mary went the lamb was sure to go." On playback, the words spoken into the phonograph rang out perfectly. Edison himself was shocked, and said "I am always afraid of things that work the first time, but here is something I have no doubt of!" The phonograph was an instant hit with the press, and crowned Thomas Edison "The Wizard Of Menlo Park". From late 1877-1878 Edison demonstrated his machine for newspapers, scientific societies, The President of the United States, Congress, and the patent office . He sold tinfoil machines for exhibition purposes, it really had no commercial value, other than a novelty. Various different models were marketed by The Edison Speaking Phonograph Company until about 1880. Edison went on to work on electric light, in 1879 and gave the world the first Practical light bulb along with a whole distribution system including the dynamo, switches fuses, conduit receptacles, and meters. Alexander Graham Bell of Telephone fame, was quite surprised by Edison's Phonograph , and wondered why he had not thought of it himself, and was quite envious! 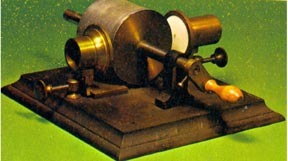 Starting in 1881 Chichester Bell , and Charles Sumner Tainter worked on a machine called the Graphophone. In fact the first machine they experimented with, was a Edison parlor tinfoil machine. 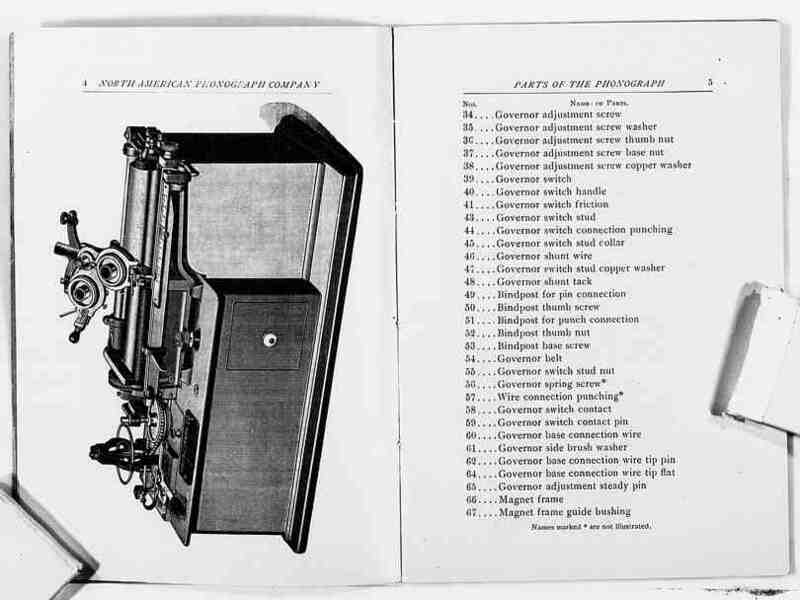 The Graphophone had many elements akin to Edison's Phonograph except the machine used an ozocerite wax filling the grooves of the tinfoil machine, and later ozocerite coated cardboard cylinders. A flexible recorder and reproducer were added. The Graphophone was powered by a foot treadle. The improvements of Bell and Tainter did make the machine better than the tinfoil, as the records could be interchanged, and played at least a few more times. Principally this machine was to be used for dictating letters. Bell and Tainter approached Thomas Edison about pooling their patents, but Edison said NO! Mr. Edison wanted nothing to do with Bell and his "Pirates"! This made Edison furious, and he went full speed ahead to regain supremacy of the Phonograph, his "baby". In 1886-87 Edison gave the research over to Ezra Gilliland. Mr. Gilliland made a phonograph that used a solid wax cylinder, and electric motor. Jonas Aylsworth, worked on the experiments for the wax-like records. Edison by 1888 decided to take over himself, research on the machine,after the completion of his new laboratory at Orange New Jersey in 1887. By June 16, 1888 after a legendary 72 hours of continuous work the perfected phonograph was finished. It used many of the Gilliland features, and also had a device to shave the records, spectacle recorder/reproducer, and the solid wax cylinders (beeswax, tallow,carnauba, and ceresin) soon followed by metallic soap. In July 1888 Ezra Gilliland negotiated with Jesse H Lippincott, a millionaire who made his fortune from the glass industry. Jesse also had made a deal with The Graphophone people. This institution was called THE NORTH AMERICAN PHONOGRAPH COMPANY. 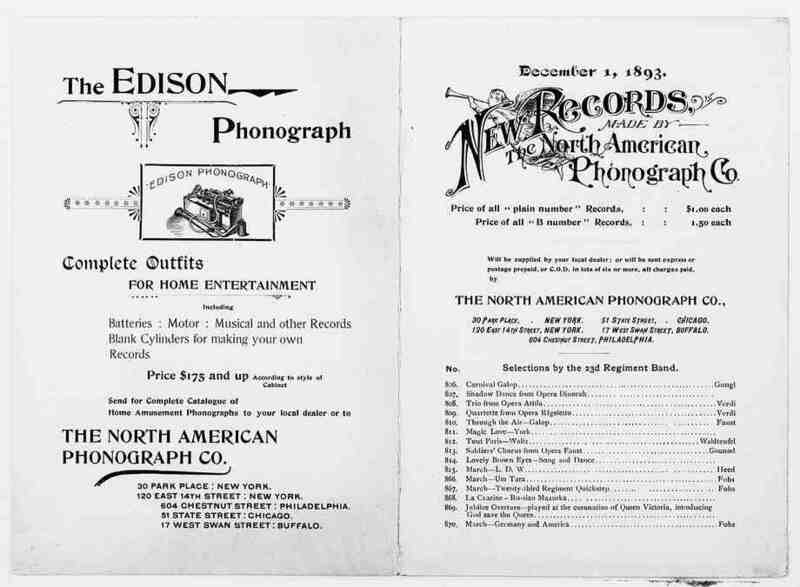 Both Edison's Phonograph, and the Graphophone were marketed as dictating machines and leased for use as such. By 1889 Music recording was accomplished, and by 1890 Music recording was started, for the coin slot phonograph. The Coin slot or "Juke Box" was invented in 1889 by Lewis Glass of The Pacific Phonograph Company, in San Francisco. Soon others such as Keller were fitting coin mechanisms to Phonograph-Graphophones. Phonograph Parlors were set up, so patrons could listen to recorded music . At first Phonographs and Graphophones were rented for $20.00 a year, and then were sold for $150.00. Cylinder records cost, when first introduced from $1.50-$5.00 each. Edison and Columbia's method for making records at first was slow and expensive. Wax blanks were cast and then shaved. To make a record artist sang into the horn of a Phonograph, the sound waves were concentrated onto a glass diaphragm, which vibrated a jeweled cutter, that engraved a hill and dale groove into the surface of the record. Most records dating from 1888-1892 were original recordings, each one unique and different. Sometimes several machines at once, with banks of horns pointed at the artists were used. By 1901 this method was no longer used. Edison in 1900 started to produce two minute Gold Moulded cylinders. From 1889-1896 the total production of the recording industry was around two million records. Edison's after five days and nights of continuous work taken June 16, 1888. Recording cylinders on several machines. How records were duplicated up to 1898. 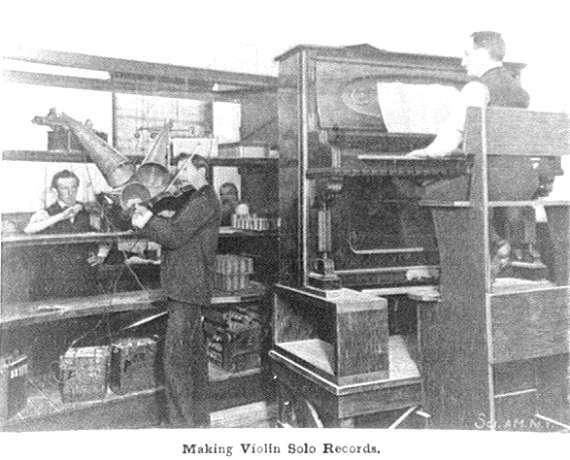 This is a rare photograph showing an 1890s Violin recording session. The machines are Class M electrical phonographs (Note the batteries on the floor.) You can see the stacks of blanks to the side of the recording machines, for replenishing for the next set of records. The horns are about 26" long and 6" at the opening. The recording diaphragm is a no. 5 glass . Today in 2002 we do use this recording method for making our live cylinders, and the same kind of studio recorder as used in this photo. I use Triumph spring motor machines. The class Ms used in this photo are next to impossible to obtain today.